Provided are a washing method and washing device making it possible to remove dirt and bacteria adhering to a container and pesticides and bacteria adhering to a crop product such as a vegetable or fruit, in a shorter period of time, by using lower concentrations of acidic water/alkaline water, and without adverse environmental impact from waste solution after washing. The washing method comprises: a washing step for washing a container (B) or crop product (A) with alkaline water; after the washing step, a sterilization step for sterilizing the container (B) or the crop product (A) with acidic water; after the sterilization step, a rinsing step for rinsing the container (B) or the crop product (A) with a rinse solution; a purification treatment step for recovering the waste solution of the alkaline water used for washing and the waste solution of the acidic water used for sterilization, and running the alkaline water and acidic water through a purification treatment with a photocatalytic material; and, after the purification treatment step, a filtration step for filtering the alkaline water and acidic water with a filter. Providing the solution having been filtered with the filter for use with alkaline water/acidic water also makes it possible to provide a circulation-type washing device (10) and washing method. The present invention is a container having an opening, relates to a cleaning method and cleaning apparatus for crops such as vegetables. When cultivating vegetables and fruits, in order that spraying pesticides on the surface of vegetables and fruits even after harvest, pesticides are attached. Therefore, prior to eating raw or cooked, it is essential to remove the pesticide remaining. The pesticide removal, various techniques is employed and is also a method of using the agricultural chemical removal detergent is employed, the rinse the pesticide removal detergent, there is a problem with requiring a large amount of water . Patent Document 1, a pesticide which remains on the surface of crops such as vegetables as a cleaning solution that can sufficiently removed, is a technique using an acidic water produced at the anode side by membrane electrolysis of sodium chloride solution as the electrolytic water . However, not been made considerations effluent treatment after pesticide removal in this technique, even if it is the removal of pesticides component adhering to crops by waste pesticides is mixed is discharged, the negative environmental there is a fear of giving. In addition, in recent years, growing awareness of ecology is, for example, for drinking water container to separate collection, such as PET bottles and glass bottles, by reusing these, the movement to recycle limited resources have been activated. However, the step of performing a separate collection and reuse of containers for drinking water tedious, because recycling of resources at present, not getting along, from the viewpoint of simplification and efficiency, spent water movement to try to re-use by washing the use container has also come out. As an apparatus for cleaning in this way the used beverage containers, for example, Patent Document 2, by inserting the nozzle into the container for drinking water, the water jetted from the nozzle, the inner bottom and the sides of the container apparatus for cleaning have been proposed. Further, Patent Document 3, the filtered water by reverse osmosis membrane module was injected into the vessel for drinking water system for cleaning has been proposed in the container. However, the cleaning device as described above is merely only wash away the used water container with water, until drying the container after or washing to disinfect the vessel has not been taken into consideration. Here, PET bottles, water washing of glass bottles, when carried out in general detergent surfactant is blended, it takes a large amount of water to rinse the detergent, resulting mixed a large amount of detergent but there is a problem that is ejected. Therefore, in Patent Document 4, without the use of detergents, after the oil adhering to the dishes at reduced water generated on the cathode side was emulsified to microbial degradation microparticles state by the sodium chloride solution to membrane electrolysis , sodium chloride aqueous solution was washed sterilize the dishes under acidic water produced at the anode side by membrane electrolysis, after rinsing, creating waste receptacle for storing waste water, emulsified in particulate state in the drainage member after the grease is decomposed by microorganisms, by adsorbing the grease that has not been decomposed into cotton-like member made of microfiber, it proposes washing techniques that no adverse effect on the degradation environment. However, the washing technique described in the cited document 4, by acidic water used for washing and disinfecting the waste solution is mixed, also the acidic water acts on microorganisms, the microbial degradation does not go sufficiently there is a problem. As mentioned above, dirt and bacteria adhering to the container having an opening, also pesticides and bacteria adhering to the crops such as vegetables and fruits, reduced water was produced in the membrane electrolysis of aqueous sodium chloride at acid water washing, be capable of sterilization, at present, make these waste liquid treatment is not sufficiently performed, which adversely affect the environment. Further, the reduced water, acid water, although produced by performing membrane electrolysis of aqueous sodium chloride solution, sufficient sterilization, a high concentration of acid water in order to cause the cleaning, has been used to generate the reduced water. Acidic water of high concentration, the use of reduced water, skin roughness, etc., adversely affect the human body. Furthermore, a possibility to produce high concentrations of acid water, the reduced water is relatively but high concentrations of sodium chloride solution it is necessary to membrane electrolysis, where the toxic chlorine gas on the anode side when a large amount generated because there is a very harmful chlorine gas to the human body occurring to the large amount of some problems such as devising so as not to leak to the outside is required. The present invention, waste liquid after washing is a problem of the prior art without affecting the environment, a relatively low concentration of the acidic water, in a relatively short period of time with reduced water, adheres to the container dirt and bacteria, also an object to provide a cleaning apparatus and a cleaning method capable of removing pesticides and bacteria adhering to the crops such as vegetables and fruits. The present inventors have conducted extensive studies to solve the above problems, it found that it is possible to the problem is solved by a cleaning method and cleaning apparatus in the following items, leading to the present invention. That is, the cleaning method of the present invention is a method for cleaning a container or crops having an opening, and a cleaning step of cleaning the container or the crop at reduced water, the container or the crop after the cleaning step a disinfection step for disinfecting at acidic water against a rinsing step performs rinsing with rinsing liquid to the container or the crop after the disinfecting step, it was removed by the reduced water used in the cleaning vessel a purification step of the washing waste liquid was collected which include bacteria and the like have been removed by acid water, to purification treatment by the photocatalytic material used waste, the disinfection organics and pesticides fats like adhering is dissolved in, and a, a filtration step of filtering by a filter pesticides that can not be removed by the photocatalyst material, soil components such as fats and oils, also bacteria, solids of food residues and the like after the purification treatment steps. A method of cleaning a structure, the photocatalytic material, after nitriding the metal titanium or a titanium alloy, an inorganic acid having an etching resistance against the metal titanium or a titanium alloy, one or more acids selected from organic acids it is preferably formed by performing anodic oxidation processing for applying a spark discharge generating voltage or higher by the electrolytic solution containing. Further, in the purification process, in order to purify the effluent at photocatalyst material, it is preferable to light irradiation using a lamp or a fluorescent lamp which emits near-ultraviolet rays or ultraviolet said photocatalytic material. In addition, the acidic water used for the reduced water and disinfectant used for washing is preferably generated by membrane electrolysis to be electrolytic water dilute aqueous sodium chloride solution. Further, it said reduced water and the acid water after filtration step, be reused is preferred for the generation of the reduced water and the acidic water used for disinfection used for washing. Further, the filter is a filter to remove organic substances, filter to remove solids, to be composed of at least one or more filters are selected from the ion-exchange resin filter preferably. Cleaning apparatus according to the present invention is a device for cleaning a container having an opening, and a cleaning unit for supplying reduced water to the container through the opening, the acidic water into the container through the opening a disinfection unit for supplying a rinsing unit for supplying a rinsing liquid into the container through the opening, and a drying unit for blowing air into the container through the opening, the reduced water discharged from the cleaning unit the waste liquid containing the bacteria and the like have been removed by the acidic water discharged from the waste liquid and the disinfecting unit including soil components such as organic substances fats like adhering to the container removed Te was collected, purified by the photocatalyst material It comprises a purification treatment unit for processing, and a filtration unit for filtering the filter that could not be removed by the photocatalytic material discharged from the purge-processing portion. In the cleaning apparatus having the above structure, the cleaning unit, reduced water supply source, and having a first nozzle for injecting a reduced water from said reduced water supply source into the vessel, the disinfecting unit, the acidic water supply source, and a second nozzle for injecting the acidic water from the acidic water supply source into the vessel, the rinse unit, the rinse liquid supply source, and the container rinse liquid from the rinse liquid supply source a third nozzle for injecting within, the drying section preferably has a fourth nozzle for injecting airflow generating means, and the air sent from the air flow generating means to said container. According to this arrangement, the other container washing, since it becomes possible such disinfect or rinsing can be cleaned containers efficiently and speedily while drying the one container. As the cleaning liquid supply source and disinfecting liquid supply source, for example, other tank that stores cleaning liquid and disinfecting liquid, to produce a dilute aqueous solution of sodium chloride a reduced water and acidic water at membrane electrolysis to be electrolytic water electrolysis cathode side tank water manufacturing apparatus and may be a positive electrode side tank. Further, the first to fourth nozzle may further include a mounting surface formed of a photocatalyst material while being placed so as to protrude upward. According to this configuration, reduced water discharged from the container, even when the acidic water and the rinse solution adhering to the installation surface, reduced water droplets of acidic water and the rinse is in the installation surface by superhydrophilic photocatalytic material hardly remains, it is possible to keep the installation surface clean. The cleaning device according to the present invention is a device for cleaning the crop, the reduced water is stored, and immersible cleaning unit the crop, and storing the acidic water, and immersible disinfection unit of the crop the rinse solution was pooled and includes immersible rinse portion of the crop, the reduced water and agricultural chemicals and bacteria removed from crops by the acidic water discharged from the disinfection unit which is discharged from the cleaning unit effluent was collected, and includes a purification treatment unit for purifying process, and a filtration unit for filtering the filter that could not be removed by the photocatalytic material discharged from the purge-processing portion in the photocatalyst material. In the cleaning apparatus having the above structure, the cleaning unit, it is preferable that the disinfection unit and the rinsing unit is swingable. Further, the cleaning unit, it is preferable that the disinfection unit and the rinsing unit is composed of a photocatalytic material. In any of the cleaning device described above, the photocatalyst material, after nitriding the metal titanium or a titanium alloy, an inorganic acid having an etching resistance against the metal titanium or a titanium alloy, one or more selected from organic acids it is preferably formed spark discharge generating voltage or higher by the electrolytic solution containing an acid by anodic oxidation process of applying the. Moreover, the photocatalytic material is preferably made of metallic titanium or titanium alloy having a super-hydrophilic. Incidentally, "having superhydrophilic" in the present invention means that the contact angle with water is 10 ° or less. It is a front schematic view of a cleaning apparatus according to an embodiment of the present invention. It is a front schematic view showing the use of the cleaning apparatus according to an embodiment of the present invention. It is a front schematic view of a cleaning apparatus according to another embodiment of the present invention. Is a graph showing the relationship between the next subchloride acid concentration of the acidic water generated from the sodium chloride concentration on the anode side supplied to the electrolyzer. It will be described in detail with reference to the accompanying drawings, embodiments of the present invention. Cleaning apparatus 10 according to the present embodiment is to wash the bottles B to remove dirt and bacteria and the like adhering to the bottle B (vessel) having an opening, as shown in FIG. 1, the cleaning liquid in the bottle B as the cleaning unit 6 for supplying the reduced water, and disinfection unit 1 for supplying acid water as disinfectant in the bottle B, a rinsing unit 2 for supplying rinsing liquid into the bottle B, drying unit for blowing air into the bottle B 3, the purification treatment unit 7 for purification treatment in the photocatalytic material reduced water and the waste of acidic water or the like using the disinfection recovered used for washing, those that could not be removed by the photocatalytic material after the purification treatment and a filtration unit 8 for filtering. The cleaning device 10 includes a mounting surface 4 of the first to fourth nozzles 61,11,21,31 to be described later is installed. Cleaning unit 6, the compression and the first nozzle 61 that protrudes from the installation surface 4 upward, and a cleaning liquid storage tank (cleaning liquid supply source) 62 which reduced water is stored, in the cleaning liquid storage tank 62 by the compressor by air is sent, it is configured to reduced water in the cleaning liquid storage tank 62 is sent to the first nozzle 61. The first nozzle 61, along with a possible injection of reducing water from the cleaning liquid storage tank 62 from the tip and sides in the bottle B, and is configured around an axis 360 ° rotatable manner. The first nozzle 61 may if insertable shape in the bottle B, so that it is possible to discharge the reduced water injected into the bottle B through the opening of the bottle B, than the opening of the bottle B diameter is small. The mounting surface 4 is provided with the first regulating member 50, the movement of the by the first regulating member 50, the bottle so as not to move upward by the hydraulic pressure in the injected reduced water from the first nozzle 61 B There is restricted. First regulating member 50 is not particularly limited, for example, be mentioned which comprises a bar 501 and the upper arm member 502, the bottom surface of the bottle B to the upper piece member 502 configured to abut can be, upper piece member 502 is detachably attached to the bar 501 by screws, or may be attached to bars 501 to open a connection portion between the rod 501 as a fulcrum. Incidentally, directly from the case also to put a mouth bottle B having an opening to allow the injection of reducing water against the outer peripheral surface of the opening of the bottle B, it may be provided nozzles. The temperature of the reduced water is sprayed in the cleaning section 6, the present invention is not particularly limited, usually 5 ° C. ~ 30 ° C., preferably from 20 ℃ ~ 30 ℃. Also, time for spraying the reduced water varies by the amount of organic substances such as oils and fats adhering to the bottle B, 1 second to 60 seconds, preferably 1 second to 30 seconds, more preferably 3 seconds to 10 seconds . By shortening the spray time, it is possible to reduce the amount of waste liquid reduced water, efficiency is improved to perform wastewater treatment of contaminated reduced water. Disinfection unit 1 includes a second nozzle 11 which protrudes from the installation surface 4 upward, and a disinfectant reservoir tank (disinfecting liquid supply source) 12 that acidic water is stored, disinfectant storage tank by the compressor 12 by compressed air is sent within is configured to acid water disinfectant reservoir tank 12 is fed to the second nozzle 11. The second nozzle 11 is not only a possible injection into disinfectant solution storage tank bottle B acid water from the tip and sides of the 12, it is configured around an axis 360 ° rotatable manner. Incidentally, directly from the case also to put a mouth bottle B having an opening, to allow injection of the acidic water against the outer peripheral surface of the opening of the bottle B, it may be provided nozzles. The configuration of the second nozzle 11 and the second restricting mechanism 51, the description thereof is omitted because it is similar to the first nozzle 61 and the first regulating member 61. The temperature of the acidic water to be sprayed in the sterilization unit 1, is not particularly limited, usually 5 ° C. ~ 30 ° C., preferably from 20 ℃ ~ 30 ℃. Also, time for spraying acidic water, varies by bacterial contamination degree attached to the bottle B, 1 second to 60 seconds, preferably 1 second to 30 seconds, more preferably 3 seconds to 10 seconds. By shortening the spray time, it is possible to reduce the amount of waste liquid of the acid water, efficiency is improved to perform wastewater treatment of contaminated acid water. Reduced water and acidic water as described above, for example, can be produced by the following method. That is, by the sodium chloride solution is membrane electrolysis in the electrolytic cell provided with anode plate and cathode plate via the ion permeable membrane that transmits anion or cation, the reduced water is generated on the cathode side at the same time, the anode in the side acidic water is produced having sterilizing properties. As the sodium chloride solution in the electrolytic bath, the concentration of 0.001 to 0.5% of preferably dilute of .01 to 0.5%, more preferably from 0.01 to 0.2% it can be used an aqueous sodium chloride solution. Accordingly, dilute reduced water and acidic water that does not affect the human body less environmental load is generated. Incidentally, the reduced water is pH 10.25 ~ 12.00 and ORP (oxidation-reduction potential) -121MV ~ about -858MV, also acid water, pH2.10 ~ 3.50 and ORP (oxidation-reduction potential ) is the + 746mV ~ + 1171mV about. In the present embodiment, by the electrolytic water producing device 9, generated above-mentioned dilute reduced water and acidic water, respectively the cleaning liquid storage tank (cleaning liquid supply source) 62 and disinfectant storage tank (disinfectant supply) supplied to the 12 It is. Rinsing unit 2, the third nozzle 21, a rinsing liquid and a rinsing liquid storage tank (rinse liquid supply source) 22 to be stored, rinsed by the compressor liquid reservoir tank 22 protruding from the installation surface 4 upward compressed air that is sent, is configured to rinse rinse the reservoir tank 22 is fed to the third nozzle 21 within. Incidentally, as can also rinse the injection with respect to the outer peripheral surface of the opening of the bottle B, it may be provided nozzles. The configuration of the third nozzle 21 and the third regulating device 52, the description thereof is omitted because it is similar to the first nozzle 61 and the first regulating member 61. The rinse is not particularly limited as long as there is no residual property to the bottle B, it is preferable to use a consideration of economy and tap water. Drying section 3 includes a fourth nozzle 31 that protrudes from the installation surface 4 upward, the airflow generating means 32. The air stream generating means 32, as long as it can generate an air flow toward the fourth nozzle 31 is not particularly limited, for example, using a compressor and for generating a compressed air, an air pump, a fan or the like, a variety of be able to. The drying section 3, in order to shorten the drying time of the bottle B, it is preferable that a heater for heating the air sent from the air stream generating means 32 to the fourth nozzle 31 (not shown) is provided. The configuration of the fourth nozzle 31 and the fourth restricting mechanism 53, the description thereof is omitted because it is similar to the same as the first nozzle 61 and the first regulating member 61. Installation surface 4 is preferably formed of a photocatalytic material. Photocatalyst material may also be a metallic titanium or titanium alloy having a super-hydrophilic. Specifically, after forming a titanium nitride metallic titanium or titanium alloy surface, containing at least one acid selected from the group consisting of inorganic acids and organic acids having an etching effect on the titanium electrolytic spark discharge generating potential or voltage in liquid (typically 100V or higher, preferably 150V or higher) by performing the anodic oxidation process of applying the photocatalytic function to exhibit the super hydrophilic contact angle with water becomes less than 10 ° the it can be applied to the metallic titanium or titanium alloy surface. As a method for forming a titanium nitride, for example, PVD, CVD, thermal spraying, and can be exemplified a heat treatment or the like under a nitrogen gas atmosphere, convenience, mass productivity, and from the viewpoint of production cost and the like, nitrogen heat treatment under a gas atmosphere is preferred. The electrolyte used in the anodic oxidation treatment may be selected from inorganic and organic acids having etching against titanium, sulfuric acid, phosphoric acid, hydrofluoric acid, hydrochloric acid, inorganic acids such as aqua regia, and oxalic acid, formic acid, an organic acid such as citric acid may be used singly or in combination of two or more thereof. In this way, by constituting the mounting surface 4 in the photocatalytic material, reduced water discharged from the bottle B, the droplets of acidic water and the rinse liquid hardly remains in the installation surface 4, to keep the installation surface 4 clean it can. Purge-processing portion 7, washed as described above are those carried out disinfection and reducing water effluent used for rinsing, acid water effluent and rinses recovered by purification treatment of the (that all collectively waste), capable of storing waste such inside the waste liquid storage tank is of the configuration in which established the photocatalytic material. The photocatalytic material used in the purification process of the waste, after forming a titanium nitride metallic titanium or titanium alloy surface, an inorganic acid having an etching action on titanium, at least one or more selected from organic acids by carrying out anodizing treatment in an electrolytic solution containing an acid is applied to the spark discharge generating voltage or higher, the one obtained by forming an anatase type titanium oxide having a high photocatalytic activity into metallic titanium or titanium alloy surface it can be used. As a method for forming a titanium nitride, PVD, CVD, thermal spraying, and there is a heat treatment under a nitrogen gas atmosphere, convenience, mass productivity, and from the viewpoint of the production cost and the like, under a nitrogen gas atmosphere heat treatment is preferred. As the acid to be used in the anodizing treatment, sulfuric acid, phosphoric acid, hydrofluoric acid, hydrochloric acid, inorganic acid or aqua regia, oxalic acid, formic acid, one or more acids selected from organic acids such as citric acid It is used. Thus the waste liquid tank installed The prepared photocatalyst material, poured waste, by irradiating near-ultraviolet rays or ultraviolet rays can be optically pumped anatase type titanium oxide photocatalytic material at lamp or a fluorescent lamp, very active high strong oxidizing power OH radicals and superoxide anion (O 2 -) active oxygen is generated, such as, it is possible to decompose the hardly degradable organic matter in the effluent. Therefore, it is possible to perform sterilization of fats and oils of organic bacteria which have not been sterilization by decomposition or acid water in the effluent. Waste purification technology using the photocatalytic material is different from the biodegradation being performed conventionally, there is no fear that the effect is reduced even if the acid water coexist with antimicrobial properties. In the microbial degradation, whereas it is necessary to wither put sometimes microbial layer, waste purification technology of photocatalytic reaction, permanently effect lasts if any light irradiation. Moreover, the photocatalytic material that is coated on the surface of ordinary titanium oxide particles in a binder or the like, only the titanium oxide particles exposed to the surface will not exhibit just high photocatalytic activity the photocatalytic reaction, the substrate adhesion is also there is a problem such as inferior with, after the photocatalytic material of the present embodiment is obtained by forming a titanium nitride metallic titanium or titanium alloy surface, an inorganic acid having an etching action on titanium, organic It is a material where the metal titanium or titanium alloy surface is optically catalyzed by performing the anodic oxidation process to apply a spark discharge generating voltage or higher at least one or more kinds of an electrolytic solution containing an acid selected from the acid for, in order to have excellent also high adhesion photocatalytic activity, it is also possible to perform the sterilization of highly efficient waste organic decomposition and bacteria over a long period of time. In order to improve the photocatalytic reaction, it may be added a small amount of ozone and hydrogen peroxide. Filtration unit 8, food residue and bacterial debris contained in the waste liquid after purification treatment, organic substances that can not be decomposed by the photocatalytic material is intended to remove from the waste liquid, waste liquid of the waste liquid flow pipe can pass are those of the configuration set up a filter to the inside. The filter, activated carbon, hollow fiber membrane, by using a porous material such as continuous porous material, dirt of the bottle B that has not been decomposed by the photocatalyst material, a grease or the like can be filtered. Also, if the ionic substance is contained in the waste can be removed by using an ion exchange resin filter. Furthermore, solids, such as food residues, bacteria carcasses can be removed by using a matching filter paper to the size of the solids. Filter, if necessary, by using in combination of plural kinds described above can be satisfactorily filtered effluent, it is possible to discharge in a clean state. In order to improve the filterability of the filter may be used in combination with flocculant such as poly aluminum chloride as needed. Waste in a state of being cleaned by the cleaning unit 7 and the filtration unit 8, may be discharged, and introduced into the electrolytic water producing device 9, you to are reused to generate the acidic water and reduced water preferable. By thus circulating the acidic water and the reduced water can be used efficiently acidic water and reduced water. With respect to the re-utilization for acidic water and reduced water generating, when introduced into the electrolytic water producing device 9 may optionally be added timely sodium chloride. Then using the cleaning device 10 as described above will be explained with reference to FIGS. 1 and 2. FIG. First, as shown in FIG. 2, toward the opening of the empty bottles B down to insert the first nozzles 61 in the cleaning section 6 from the opening in the bottle B, the bottle B is disengaged from the first nozzle 61 lest, placing the upper piece member 502 of the first regulating member 50 above the bottle B (Fig. 2 (a)). In this state, in the cleaning liquid storage tank 62 to supply the compressed air by the compressor, ejects reduced water in the cleaning liquid storage tank 62 from the tip and sides of the first nozzle 50 into the bottle B. In this case, the first nozzle 61, 360 ° rotation about an axis to evenly reduced water spreads into the bottle B. Predetermined time reduced water, after injected into the bottle B, and the supply of compressed air to the cleaning liquid storage tank 62 is stopped, thereby stopping the injection of reducing water from the first nozzle 61. Next, move from the first restricting mechanism 50 and the first nozzle 61 to the sterilization unit 1 Remove the bottle B (Figure 2 (b)). Then, insert the second nozzle 11 of the sterilization unit 1 into the bottle B, so as not to deviate from the second nozzle 11, to place the upper piece member 512 of the second restricting mechanism 51 above the bottle B (Fig. 2 (b)). In this state, by supplying the compressed air at the compressor to the sterilizing solution storage tank 12, it is injected into the bottle B to acid water disinfectant reservoir tank 12 from the tip and sides of the second nozzle 11. At this time, the second nozzle 11, 360 ° rotation about an axis to evenly acid water spreads into the bottle B. The acidic aqueous predetermined time after being injected into the bottle B, and stop the supply of compressed air to disinfectant storage tank 12 and stops the injection of disinfectant from the second nozzle 11. Next, move from the second restricting mechanism 51 and the second nozzle 11 to the rinsing unit 2 and remove the bottle B (Fig. 2 (c)). Then, set the third restricting mechanism 52 is inserted a third nozzle 21 into the bottle B, by supplying compressed air in the compressor to the rinse liquid storage tank 22, rinsing of the rinsing liquid inside the reservoir tank 22 the liquid from the tip and sides of the third nozzle 21 is injected into the bottle B. At this time, the third nozzle 21 is uniformly rinse 360 ​​° rotation about an axis so that the spread in the bottle B. The temperature of the rinsing solution is not limited particularly, although depending on the material of the bottle B, usually 5 ~ 80 ° C., preferably 20 ~ 30 ° C.. Incidentally, the higher the temperature of the rinsing liquid, thus shortening the drying time for the next step. For about 1 second to 60 seconds, after injecting the rinsing liquid in the bottle B, and stop the supply of compressed air to the rinse liquid storage tank 22, stops the injection of the rinsing liquid from the third nozzle 21 make. Then, set the fourth restricting mechanism 53 along with moving to the third restricting mechanism 52 and the third nozzle 21 drying section 3 and remove the bottles B from and inserts the fourth nozzle 31 into the bottle B to (Figure 2 (d)). Then, by operating the airflow generating means 32, for injecting air from the air flow generating means 32 from the tip and sides of the fourth nozzle 31 into the bottle B. At this time, if necessary, may be the air sent from the air stream generating means 32 to the fourth nozzle 31 is heated by a heater, the heating temperature at this time, depending on the material of the bottle B to be cleaned, 30 it can be a ~ 100 ℃. Fourth nozzle 31, 360 ° rotation about an axis so that the bottle B is uniformly dried. Depending on the material of the bottle B to be cleaned, for about 1 second to 60 seconds, if stopping the airflow generating means 32 after injecting air into the bottle B, and cleaning of the bottle B is complete, the bottles B again it is possible to use. Meanwhile, it washed as described above, disinfection is used to rinse, reduced water effluent discharged from the bottle B, acidic water waste, rinse effluent (waste) is collected in the purge-processing portion 7, by the photocatalytic material, the decomposition of organic matter after purification treatment of sterilization or the like and bacteria has been performed, are introduced into the filtration unit 8, the filtration process is performed. Thus, the waste liquid is circulated in the electrolytic water producing device 9 becomes clean state, it is subjected again washed bottles B, and disinfection (see FIG. 1). Incidentally, when introducing the electrolyzed water production apparatus 9 may optionally be added timely sodium chloride. As described above, the cleaning device 10 in this embodiment, in addition to the rinsing unit 2, the cleaning unit 6 and disinfecting unit 1 for cleaning and disinfecting the bottles B, is provided with the drying unit 3 for further drying the bottles B not only rinsing the bottles B, can be washed and disinfected bottles B, it can be dried bottles B after rinsing. Further, since the cleaning section 6, disinfecting unit 1, rinsed 2, and the drying unit 3 is configured with a nozzle, respectively, cleaning of a plurality of bottles B, disinfection, rinsing, and can also perform drying at the same time, efficiently and speedily it can be cleaned bottles B. In the present embodiment, washing with reduced water, sterilize with acidic water, but is configured to perform through the rinsing and separate nozzle drying, a plurality of bottles B simultaneously collectively washing , sterilization, it is also possible to design modified to rinsing and drying. Furthermore, by membrane electrolysis of dilute sodium chloride solution, dilute reduced water to produce acidic water, it is carried out dirt and cleaning of the bacteria adhering to the bottle B by using the dilute reduced water and acidic water so, it is possible to prevent the adverse effect on the human body. In addition, decomposing organic matter and bacteria contained in the waste solution in the photocatalytic material performs sterilization, organic substances not excluded further by photocatalytic material, by filtering the solid of bacteria further residue and the like through a filter, waste it can be prevented from causing environmental pollution since it is possible to clean state. Moreover, finally the waste liquid was filtered by a filter is introduced into the electrolytic water producing device reduced water by membrane electrolysis, be generated acidic water, without draining the waste liquid, added timely sodium chloride as needed at that, it is possible to construct a highly efficient recycling of the washing apparatus. Having described an embodiment of the present invention, the present invention is not limited to the above embodiments, and various modifications are possible without departing from the scope of the present invention. For example, in the above embodiment, is used a cleaning solution storage tank 62 and disinfectant storage tank 12 as a washing liquid supply source and disinfecting liquid supply source, to supply the reduced water and acidic water to the first, second nozzle as long as it can, for example, first, it may be connected to the electrolytic water producing device directly to the second nozzle. Similarly, the rinse liquid supply source, instead of the rinsing liquid reservoir tank 22, for example, may be a water supply connected to the third nozzle. In the above-described embodiment, the cleaning unit 6, disinfecting unit 1, the rinsing unit 2, and a drying section 3 is not limited to this, but was equipped with a nozzle, respectively, for example, cleaning liquid supply source, disinfectant supply, rinsed liquid supply source, and the air flow generating means connected to a single nozzle, selectively reduced water by switching valve or the like, acidic water, rinse, or may be configured to perform the injection of air. In the above-described embodiment, reduced water into the bottle B through a nozzle, supplying acidic water and rinse or had been blown, reduced water in a container, and supplies the acidic water or rinse it may not be used nozzle if it is possible or blowing. In the above embodiment, the cleaning device 10, the cleaning unit 6, disinfecting unit 1 has been equipped with a rinsing unit 2 and a drying section 3 one by one, cleaning unit, disinfection unit, a rinsing unit and a drying section a plurality It can also be provided. Further, in the above embodiment, the case of washing bottles B (container) having an opening has been described as an example, as shown in FIG. 3, it is also possible to wash vegetables, crops A fruit or the like. When cleaning the crop A is other dirt adhering to the crop A, it is possible to effectively remove the pesticide. The reduced water and acidic water used to wash the crop A, 0.001 to 0.5%, preferably from 0.01% to 0.5%, more preferably of 0.1% to 0.2% the dilute aqueous solution of sodium chloride is produced by electrolysis in diaphragm electrolysis. In this way the tank 63 which stores the generated reduced water, by immersing put crops A, for example, in the basket, by swinging the vessel 63, removing the pesticide adhering to crops A can. In this case, when the crop A ultrasonic cleaning, thereby improving pesticide removal efficiency. Then, in the same manner as the tank 13 which stores the acidic water, the crop A was immersed placed in a basket such as well, by swinging, it is possible to eradication was adhered to crops A bacterium . Next, the crop A in the tank 23 which stores the tap water by immersing placed in a basket such as well, performs the rinse reduced water and acidic water as rinsing liquid. The cleaning of the bottle (container) having an opening above, because it is carried out at the spray from the nozzles, can restrict the amount of waste by limiting the spray amount. On the other hand, the cleaning of pesticide adhered to crops A, in order to use the reduced water and acidic water was stored in the tank 63,13, each time of replacing the reduced water and acidic water in the tank 63,13 is without reduced water and supply the partially reduced water and acidic water as pesticide concentration does not increase the acid water in the tank 63,13, it is preferred to limit the amount of waste liquid in it to drain. In this way the discharged waste liquid (reduced water waste and acid water effluent, further rinse solution waste), as in the embodiment described above, the near-ultraviolet or ultraviolet lamp can photoexcitation anatase type titanium oxide, the photocatalyst material : it is introduced into the installed waste liquid tank (purge-processing portion 7) in extremely high activity a strong oxidizing power OH radicals and superoxide anion (O 2 -) by the active oxygen, such as, persistent in the effluent sterilization is performed in pesticide bacteria not eradication by decomposition or acid water is organic. Moreover, the photocatalytic material that is coated on the surface of ordinary titanium oxide particles in a binder or the like, only the titanium oxide particles exposed to the surface will not exhibit just high photocatalytic activity the photocatalytic reaction, the substrate adhesion is also there is a problem such as inferior with, after forming a titanium nitride metallic titanium or titanium alloy surface, at least one selected inorganic acids, organic acids having an etching action on titanium for a material that is metallic titanium or titanium alloy surface was light catalyzed by performing the anodic oxidation process to apply a spark discharge generating voltage or higher in an electrolyte containing species more acid, the photocatalytic activity is high since the excellent adhesion, it is also possible to perform the sterilization of highly efficient waste organic matter decomposition and bacteria over a long period of time, persistent pesticides degradation unless liquid waste is light irradiation Sterilization under acidic water was not sterilization bacteria is capable performed. Further, a small amount of ozone or hydrogen peroxide may be added in order to improve the photocatalytic reaction. Then, by filtration through a filter was introduced organic material that can not be decomposed by the photocatalytic material in the effluent, the remains of bacteria filtration unit 8, can be discharged in a clean state, to prevent environmental pollution be able to. Incidentally, the waste cleaning state, rather than discharging, similar to the embodiment described above, by circulating the electrolytic water producing device 9, if so provided for generating the reduced water and acidic water, a water the recycling of the cleaning device not newly added can be realized. Further, by constituting at the above-mentioned washing section 6, disinfecting unit 1, the contact angle of the tank 63,13,23 rinsing unit 2 with water of 10 ° or less superhydrophilic photocatalytic material, the bath 63,13, reduced water on the inner and outer surfaces of the 23, acid water, hardly remaining droplets of the rinsing liquid or the like, it is also possible to keep the tank 63,13,23 clean. Cleaning method and cleaning apparatus according to the present invention, any one so long as the cleaning of the container having an opening, vegetables, not limited to pesticide washing fruits such crops, the cleaning by the cleaning by the nozzle and immersing it also it can be applied against. Hereinafter, the present invention will be described by way of examples. The present invention is not limited to these examples. As the electrolytic water producing device is a membrane electrolysis apparatus manufactured by Alltech Inc. ALTRON-MINI AL-700A (voltage 100 V, current 0.6A electrolysis time 10 minutes) the aqueous sodium chloride solution and diluted with distilled water using a electrolytic anode It was carried antibacterial test using acid water obtained from the side. Hypochlorous acid produced acidic water, developed using DPD method prescribed in clean water test method the reagent commercial pack tested by (diethyl -p- phenyl diamine Method) (Kyoritsu manufactured RIKEN) It was determined from the 550nm absorbance using an ultraviolet-visible spectrophotometer UV mini 1240 (manufactured by Shimadzu Corporation). Using an aqueous solution of varying concentration of sodium chloride, the results obtained the following subchloride acid concentration of the acidic water produced from the anode side of the electrolysis device shown in FIG. The sodium chloride concentration and hypochlorous acid concentration, obtained correlation at varying sodium chloride concentrations, it has been found that it is possible to change the concentration of hypochlorous acid. Which is a commercially available beverage after long-term storage in the refrigerator bacteria bred after opening Japan Coca-Cola Co. Sokenbicha (registered trademark), hypochlorous acid of various concentrations of a dilute aqueous solution of sodium chloride in the membrane electrolysis and acid water containing, and by the tap water and distilled water as compared, respectively adjusted to 1 volume%, was subjected to an antibacterial test from the number of bacteria remaining in the adjusted solution. Number of bacteria was measured by the general bacterial number of the measurement method as defined in tap water test method. Specifically, the solution 0.1ml where the Sokenbicha to 1% by volume in the above-described various solution was spread on a standard agar medium (manufactured by Nissui), and generates at be cultured at about 24 hours 37 ° C. to determine the number of bacteria from the number of colonies. Table 1 0.015% sodium chloride aqueous solution to prepare an acidic aqueous various hypochlorous acid concentration at that timely diluting acidic water produced from that membrane electrolysis, shows the results of examining the antimicrobial . Hypochlorous acid concentration of the acidic water express significant antimicrobial at least 0.6 ppm, when there is a hypochlorite of about 1 ppm, it was found that the bacteria do not remain. Although there is hypochlorite of about 1ppm to tap water it has also been found that show no antibacterial activity in tap water. Also include hypochlorite same concentration, focusing on antimicrobial differ in the tap water and acidic water, timely added phosphate buffer at a pH adjusting agent in acidic water (manufactured by Horiba) and, the results of general bacteria count tests similar with a solution having a controlled pH are shown in Table 2. Show strong antibacterial in dilute aqueous sodium chloride solution of 0.01% obtained by membrane electrolysis weakly acidic (pH 3.4), when such neutral to adjust the pH, as with tap water exactly it was found, but do not exhibit antimicrobial properties. The study results from acid water dilute aqueous sodium chloride solution and membrane electrolysis, despite for damage resistance of the human body at the same level as the tap water is hypochlorous acid concentration no worries at all, that there is a strong antibacterial it was found. Washing was carried out testing of containers with reduced water generating at the cathode side at the membrane electrolysis of dilute sodium chloride solution. It was evaluated using the oleic acid which contains a large amount of edible oil as a contaminant. Oleic acid concentration was determined from measuring the oleic acid in methyl esterification kit gas that (Nacalai Tesque) at for 3 hours derivatized chromatographic GC-2014 (manufactured by Shimadzu Corporation). The test method was used beaker as a container having an opening. The beaker was attached oleic acid was 3 seconds sprayed at a spray volume of 1800 ml / min reduced water generating at the cathode side at the membrane electrolysis of dilute sodium chloride solution. After spraying, the oleic acid adhered to the beaker, those a solution dissolving hexane (Wako Pure Chemical) was methyl-esterified and analyzed by gas chromatography, to determine the oleic acid remaining amount. The results of evaluation of the cleaning of the container from the initial coating weight and oleic acid remaining amount shown in Table 3. Increasing sodium chloride concentration for use in membrane electrolysis, as dark hypochlorous acid on the anode side of the acidic water, also as high pH, ​​the washing rate of oleic acid has resulted in improved, the acidic water side 90% removal is achieved in reduced water obtained by membrane electrolysis of 0.01% sodium chloride aqueous solution having a hypochlorous acid concentration comparable to tap water Te. Also in the spray only 3 seconds, since the high detergency with reduced water produced by membrane electrolysis of dilute sodium chloride solution is ensured, it can limit the amount of solution used for washing, and finally the amount of waste liquid discharged also decreases, thereby improving the efficiency of filtration of the process and filter with photocatalytic material. It was performed pesticide removal test using reduced water generating at the cathode side at the membrane electrolysis of dilute sodium chloride solution. Sumithion emulsion as a contaminant (manufactured by Sumitomo Chemical Co., main ingredient: Fenitrothion C 9 H 12 NO 5 PS) was used. The solution 0.05ml diluted 10-fold with distilled water Sumithion emulsion adhering to the glass slide 76 mm × 26 mm, and dried at 1 day room temperature, it was deposited pesticide to the glass slide. Immersing the glass slides by adhering the pesticide in distilled water again 50ml those immersed for 30 seconds in the reduction of water 200 ml, ultrasonic cleaner ASU CLEANER ASU-3D (manufactured by AS ONE Corporation) for 15 min at 43KHz with greater and wave washing, and the pesticide adhered to the slide glass was completely dissolved in the solution. Preparation was completely dissolved pesticides adhering to the slide glass before and after the reduced water washing solution, respectively, were analyzed. Pesticides removal rate was determined from the pesticide adhered amount of the slide glass before and after the reduced water wash. Analysis of pesticides Sumithion emulsion, based on JISK0102 46.3.1 potassium peroxodisulfate decomposition, alter the phosphorus in fenitrothion phosphate. 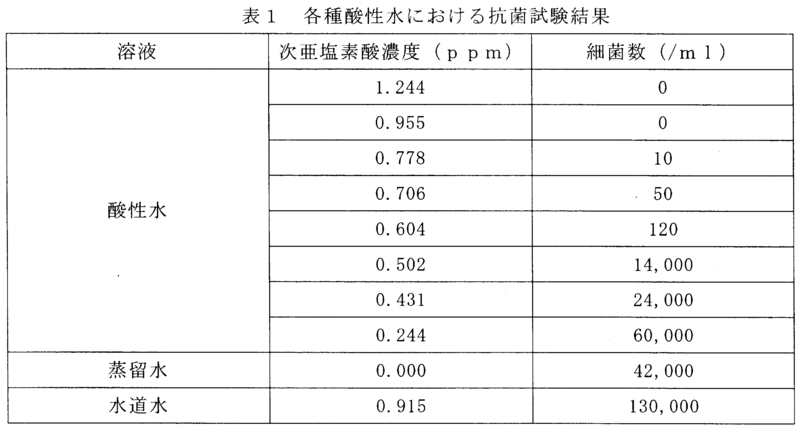 The phosphoric acid concentration and developed by JISK0102 46.1.1 molybdenum blue absorptiometry, from measuring the absorbance of 880nm using a UV-visible spectrophotometer UV mini 1240 (manufactured by Shimadzu Corporation) to determine the pesticide coating weight. Tables 4 and 5 is a pesticide removal rate measurement result using the generated on the cathode side at the membrane electrolysis from a dilute aqueous solution of sodium chloride reduced water. Specifically, it reduced water tables 4 and 5, with 0.13%, reduced water produced from the cathode side at the membrane electrolysis of 0.20% aqueous sodium chloride solution. Hypochlorous acid concentration of the acidic water side simultaneously produced in this reduced water producing at the anode side, with a reduced water respectively 20 ppm, are generated at the same time of 40 ppm. By increasing the concentration of reducing water, pesticide removal rate was improved. Compared with the method of the container washing, the reduced water is not use those high concentrations pesticides can not be effectively removed, whereas the containers cleaning method to clean by spraying, pesticide washing reduced water it is sufficient newly supplied part only for cleaning by immersion in a bath which accumulate also improves the efficiency of the filtration of the process and filter in the waste liquid amount is limited photocatalyst. Cleaning method and a filtering step of filtering by the filter reduced water effluent and the acidic water waste liquid after the cleaning process. The photocatalytic material, the metallic titanium or titanium alloy after nitriding treatment, an inorganic acid having an etching resistance against the metal titanium or a titanium alloy, the electrolyte solution containing one or more acids selected from organic acids the cleanup method of claim 1, which is formed by performing anodic oxidation processing for applying a spark discharge generating voltage or higher Te. In the purification process, cleaning method according to claim 2 which emits near ultraviolet or ultraviolet said photocatalytic material. The cleanup method of claim 1 wherein the acidic water used in the reduced water and disinfectant used for cleaning, which is generated by the membrane electrolysis to be electrolytic water dilute aqueous sodium chloride solution. The cleanup method of claim 4, wherein the reduced water and the acid water after filtration step is recycled for production of the reduced water and the acidic water used for disinfection used for washing. The filter, filter for removing organic matter, a filter for removing solids, cleaning method according to claim 1 having at least one or more filters selected from the ion-exchange resin filter. Cleaning apparatus and a filtration unit for filtering with a filter the reduced water effluent and the acidic water effluent discharged from the purge-processing portion. The photocatalytic material, the metallic titanium or titanium alloy after nitriding treatment, an inorganic acid having an etching resistance against the metal titanium or a titanium alloy, the electrolyte solution containing one or more acids selected from organic acids cleaning apparatus according to claim 7 or 8 is formed by performing anodic oxidation processing for applying a spark discharge generating voltage or higher Te. The drying unit, the cleaning device according to claim 7 having a fourth nozzle for injecting airflow generating means, and the air sent from the air flow generating means to said container. Cleaning apparatus according to claim 10, wherein the first to fourth nozzle further comprises a mounting surface formed of a photocatalyst material while being placed so as to protrude upward. The cleaning unit, the sterilization unit and the rinsing unit cleaning apparatus according to claim 8 is swingable. The cleaning unit, the cleaning device according to claim 8, wherein the disinfection unit and the rinsing unit is formed in the photocatalyst material. The photocatalytic material, the cleaning device according to claim 11 or 13 which is a metallic titanium or titanium alloy having a super-hydrophilic.